ይህን የመሰለ ጥቅም ስለምናገኝበት ማየት ተስኖን ጊዜ ማባከን አድርገን እንቆጥረዋለን፡፡ማስተዋልንና አጥርቶ ማየትን እግዚአብሔር ይስጠን፡፡ አሜን! ይህን የመሰለ ነገር ለማግኘት እኛ ግን የምናስበው ጊዜ ማባከን አድርገን እንጂ ጉዳት መሆኑን አልተረዳንም ብቻ እግዚአብሔር ነገሮችን በጥሞና አጥርተን እንድናኝ ይርዳን፤ ያበርታን፡፡ አሜን!!! we are always busy for such a kind of things which are really necessary for our lives but the thing is from the very beginning the meaning of "BUSY" is "Being Under Satan Yolk". So the Almighty God kept us from being as such and he may give us the passion to be like our holy fathers and mothers. Thankyou Danny,for reminding Prayer time,i always of think of it why not doing so..ጊዜ ሳይሆን ፍላጎት እንደሌለን እንገነዘባለን፡ ..becuse of,we claim for our self we'll doit after this time or someting...sebeasebe..
አፄ ቴዎድሮስ ጻድቅ ነበሩ ማለት ነውን? ታድያ ራሳቸውን መግደላቸው እንዴት ይታያል? It is called bravery...dying free and with dignity. Do you think falling in the hands of the British was a wise idea? What would they have done to him? Hi Dani I just want be provocative,I know you may not like my idea, but it is just my free man opinion. If God really love us why do we need to pray? We are his children, so... I am confused here you are saying Theodros is a busy king who allocate time to pray and also kill his opponents? don't you see a paradox? just my opinion. Yes, Prayer is very important to stay in connected with God in our spiritual life and compose ourselves at the same time. We are not praying to praise God, it is for ourselves to be blessed. If we pray, ultimately we are the ones who benefit out of it, nobody else. The analogy of prayer and Tewodros, however, seems paradox to me. There are many religious people from bible scripture and even from our other religious books to be picked as an example for your analogy. 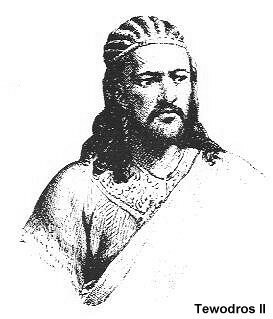 Tewodros was a hero for the unity of our country and people. But, at the end he killed a lot of people, including himself. If a person saves many and can't save himself, he wouldn't be the best example for prayer. As far as I know, if somebody commit suicide, he will not receive any prayer from our church; it is considered as a sin. I am not judging him but, my argument here is that the inappropriate analogy of Daniel's article, which is not expected from a wise preacher. In conclusion, even if I don't agree with the analogy, I definitely agree with the message behind the article. We need to allot time for prayer at least once a day. If we can budget all of our time, I am equivocal we can fit prayer in that schedule. በዘመናችን በአንድ በኩል ጸሎተኛ ነን እያሉ በሌላ በኩል ደግሞ በስመ "ትግል" ሌሎችን የሚያሳድዱና መድረሻ የሚያሳጡ አማንያን በርካታ ናቸው። ለመሆኑ እግዚአብሔር ይዘበትበታልን? እስኪ አስረዱኝ ጸሎትና የፖለቲካ ትግል ምን አንድነት አላቸው? for the comment above asking እስኪ አስረዱኝ ጸሎትና የፖለቲካ ትግል ምን አንድነት አላቸው? በከንቱ ግን ሰይፍ አይታጠቅምና ክፉ ብታደርግ ፍራ፤ ቍጣውን ለማሳየት ክፉ አድራጊውን የሚበቀል የእግዚአብሔር አገልጋይ ነውና።"
Daniel Thank You for this inspiring blog keep more coming and GOD BlLESS YOU!!! Tewodros was a hero for the unity of our country and people.he was unique for Ethiopian and Ethiopia.God bless him. "ከእግዚአብሔር ካልተገኘ በቀር ሥልጣን የለም፤ ያሉትም ባለ ሥልጣኖች በእግዚአብሔር የተሾሙ ናቸው።"
መንፈሳዊ ሰው ግን ሁሉን ይመረምራል ራሱ ግን በማንም አይመረመርም።"
Daniel i think you really should look at the posts before you approve them i dont like to see "The Word Of GOD" being ridiculed by non believers. And you as a deacon; i think you shouldn't approve such comments. Enjoyed reading your article Dn. Daniel. Our fathers remind us that the two biggest obstacles put by the devil to separate us from strengthning our relationship with God are laziness and busyness. Endih yalu meri bene Meles Zenawi ayinet sewoch lemesedeb dersewal.